Samsonite Luggage Review: The Best Overall Luggage Brand? Samsonite Luggage Review: The Best Luggage Brand? Samsonite has been around since 1910, and now they’re BY FAR the most popular luggage brand. In this Samsonite luggage review, we will determine how durable their cases really are and how they compare with other luggage brands. We’ll go in-depth on their quality, ratings, warranty, features, and prices down below. We tested the most popular suitcases that Samsonite has to offer, like the Winfield 2, the Centric, and the Silhouette. And we’re impressed with how rigid, practical, and affordable these cases are. Although Samsonite isn’t the absolute winner in our rating system, they live up to their name. Samsonite offers the perfect blend of quality, features, design, and prices and it’s easily understandable how they’ve become so large. Overall, we’ve given them 85 out of 100 points, which is very high. To compare, the first place is taken by Travelpro, standing at 90 points. Solid build quality. Although we’ve seen better build quality on Travelpro, Eagle Creek, Briggs & Riley, and Rimowa, Samsonite’s suitcases are made to last. Reliable warranty and support. Samsonite is very well known for their excellent support and warranty. Although they don’t offer a lifetime warranty, they do offer five and ten-year warranties. Excellent reviews. Their bags are popular and have been tested by thousands of people. Most of their buyers are repeat customers, who’ve been loyal to the brand for decades. Limited packing features. Most of their affordable suitcases don’t offer packing features that you would get excited about. Some newer brands are doing a much better job at coming up with unique and smart packing features. Some models can get expensive. Although you can get a good quality suitcase for less than 100$, some of their premium models can cost up to 700$. The sleek and affordable Winfield 2 is the best overall hardside that Samsonite has to offer. It’s also their most popular model, available in 20, 24, and 28 inches. The perfect combination of durability and features. Although it looks pretty flat, the little Silhouette Xv has some unique features and is overall their best softside suitcase. If you’re looking for a full set, we suggest going with the Winfield 2. Although the Omni PC 3-piece isn’t bad as well, the Winfield 2 is better-looking and offers more features. Now, they mainly manufacture suitcases, bags, briefcases, and other travel products. 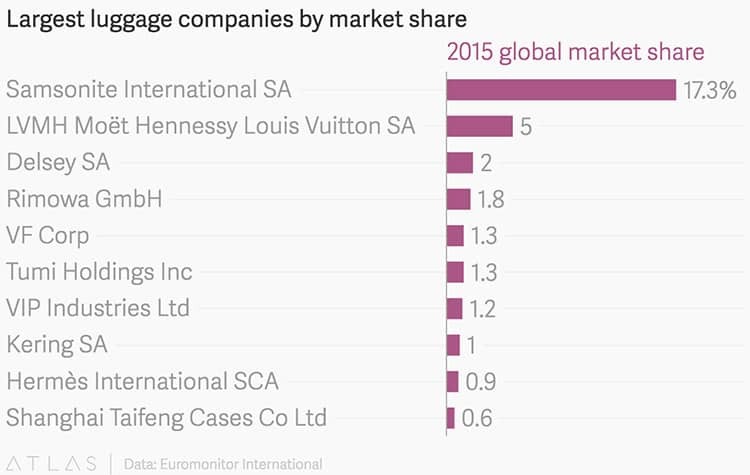 Today, Samsonite is the most popular luggage brand out there (Three times bigger than the second place, Lois Vitton). Over the years they’ve acquired several other luggage manufacturers, like American Tourister, Hartmann, Tumi, eBags, High Sierra, and Lipault. All brands combined, by the market share they’re seriously winning every other luggage company out there. Although it doesn’t mean they’re necessarily the best brand, their products are of fantastic quality and have received stunning reviews. Samsonite is very popular and available in almost any retail luggage store or online luggage store. So naturally, their products have received thousands of reviews from people who have been testing them for several years. And we do have to say, that the reviews are pretty good. Although we’ve seen better reviews (For instance, on Travelpro luggage), the Samsonite ones are pretty close. Most of their products receive 70-85% customer satisfaction scores, which is high. Because Samsonite has so much age behind their company, they have a large customer base that has been using their products for decades. It’s not uncommon for their customers to use their luggage for 20-30 years, because Samsonite always has resonated with an excellent warranty, support, and durability. Overall, we’ve rated their customer feedback at 25 out of 30 points. To determine how good their quality is, we tested the Silhouette fabric carry-on, the Winfield 2 hardside, and the Centri hardside. A Samsonite representative allowed us to take these cases out for a spin, and we must say, that we’re impressed by the results. On the Silhouette, we liked how durable and massive the spinner wheels were. It’s not uncommon for spinner wheels to break off, and for the Silhouette, the wheels are more rigid and massive than anything else we’ve seen. Another thing that we noticed is that on all cases the retractable handle seems to be of improved quality. It didn’t wobble at all and used much more locking positions than we’ve usually seen. Usually, the handle locks in three or four different positions, but on the Silhouette carry-on, we counted eight different heights. As for the Winfield 2 hardside, the polycarbonate frame didn’t feel too sturdy. The outer shell was really flexible, not that it was necessarily a bad thing. Other hard shells we’ve tested were much stiffer. We later looked at how they hold up after a few years of usage, and it seems that the increased flexibility isn’t a bad thing – It results in less potential cracks. Aside from our tests, we researched a lot of data on how Samsonite’s cases hold up for their customers. We found out that they do live up to their name when it comes to durability, but they’re not as good as Travelpro, Briggs & Riley, Rimowa, or Eagle Creek. If you’re using Samsonites bags for daily or weekly, you can expect the bags to last anywhere from five to ten years. As large as Samsonite is, you wouldn’t be surprised that their suitcases are well-equipped with innovative features, as they have the budget to spend on R&D. They’re using innovative materials and new solutions to make their bags more appealing. On most of the Samsonites hardside suitcases, you will find an integrated combination TSA lock, which is a nice feature to have. Especially, if you’re paying 100$ or more for a hardside suitcase. Where it gets interesting though is their fabric cases, most manufacturers stop at hardside suitcases, yet Samsonite has managed to add TSA locks to fabric bags as well. And they’ve done it with a smart cable system for their combination TSA lock. You get a cable that pulls through all of your exterior zippers and connects with the TSA lock. This way all of the outer pockets are locked, instead of just the main compartment. Though, this feature is available solely on their premium fabric suitcases. On their premium suitcases, Samsonite offers integrated USB ports for easier charging in airports, trains, and while communicating. (Power bank not included) Basically, you can keep your power bank inside a dedicated pocket, and connect your mobile phone through the exterior USB ports. Some argue that integrated USB ports are useless. Although they’re not essential to have, we think that it’s a nice feature to have. On some of their most recent models, Samsonite has started implementing their own “Right Height” handle system. It’s a fancy way of naming a retractable handle with more-than-average fixed heights. Usually, you get two to four fixed heights. In Samsonite’s system, you get eight, which can be beneficial to some people. Most of their suitcases come with spinner wheels. Based on other customer reviews, we didn’t see much issues with faulty spinner wheels, which is a common issue for most brands. If you go for some of their newer models, instead of regular spinner wheels, you will get double wheels with Tru Trac technology. They’re made in a way to reduce the steering effort and improve the ability to roll in a straight line. Almost all of Samsonite’s fabric bags offer water resistance to some degree. Some are coated with SamGuard water-resistant coating, and some made from naturally water-resistant materials, like ballistic nylon. This doesn’t mean that you can go swimming with them. It does, though, that light rain won’t get the contents of your bag wet. We’re glad to see that this feature isn’t an extra and is included in most of their suitcases, both hardside and softside. This feature allows the suitcases to expand by additional 1.5-2 inches, which results in an extra 15-25% packing volume. A must for checked bags. Although from the outside, they’re well-equipped, we’d like to see better packing features, which is why we rated their features at 13 out of 15 points. Although Samsonite’s low-end fabric suitcases look generic, we think that their hard shell bags look stunning. Especially, the Winfield 2 hardside carry-on. Above all, we value that Samsonite has their own values and target audience that reflect on their bags. They’re made for business professionals, frequent travelers, and people who appreciate discrete and sleek looks over flashy ones. Same goes for their design, you won’t find anything flashy or too colorful, but you will find something modern and stylish. Because of their style and image, we’ve given them 13 out of 15 points in the design. Samsonite is very well known for their outstanding warranty and helpful support. That’s why they’ve got loyal clients who remain loyal for decades. All of Samsonite’s suitcases are covered by either: Limited Global warranty, Limited 3-year warranty, or Limited 10-year warranty. The only difference that you get between these types is the period at which these warranties are valid, which is either a lifetime, ten years, or three years. These warranties don’t cover normal wear and tear, transportation damages, or any damages caused by improper use. Basically, they cover only manufacturing defects or any defects that arose from using improper materials. It may not sound like much, but we’ve seen countless cases of their clients getting free warranty repairs when it clearly looks like they shouldn’t have. They go above and beyond to keep their customers loyal. Ship the item to the warranty repair center at your own cost. Take your suitcase to the nearest Samsonite shop, and they’ll ship it to the repair center for a small fee of 10-15$, depending on how large is the briefcase. We like the second option, because Samsonite stores are available in almost all large cities, worldwide. Additionally, if the warranty doesn’t cover your suitcase, they’ll offer to repair your bag at a cost. If you wish to do the repairs yourself, you can contact them directly and purchase some replacement parts separately relatively cheap. Overall, Samsonite has a reputable and dependable warranty, which is why we’ve given them 9 out of 10 points. Although Samsonite’s suitcases may seem on the higher end, they actually aren’t. 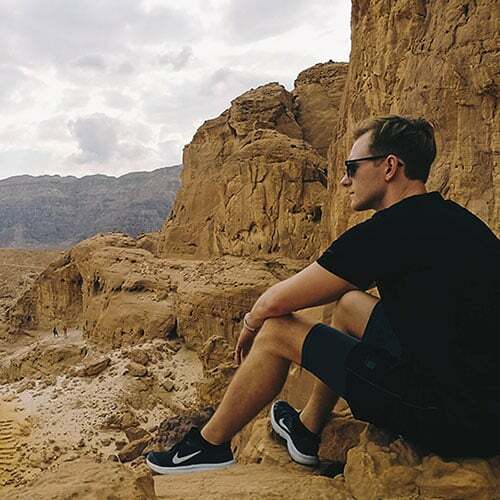 Yes, they do offer some premium suitcases that cost up to 700$ through their online store; however, they have a wide variety of affordable bags that cost around 100$. Also, we’ve seen that often prices listed on Amazon are 20-40$ cheaper than what they’re offering on their website. Make sure to check multiple sources before buying. Given their durability and features, their affordable options in the 100-200$ price range are valued the best. We’ve seen some premium Samsonite cases at around 300-400$ that don’t make much sense and are overall overpriced. That’s why we’ve rated their prices at 8 out of 10 points. Samsonite is an excellent option for the masses. Some other brands offer better durability, warranty, features, or look better but, usually, lack in other aspects. Samsonite combines everything in a well-made suitcase that is a solid option for nearly everyone. Whether you’re a businessman, a single mom, or in your mid-20’traveling the world, by choosing Samsonite, you really can’t go wrong. 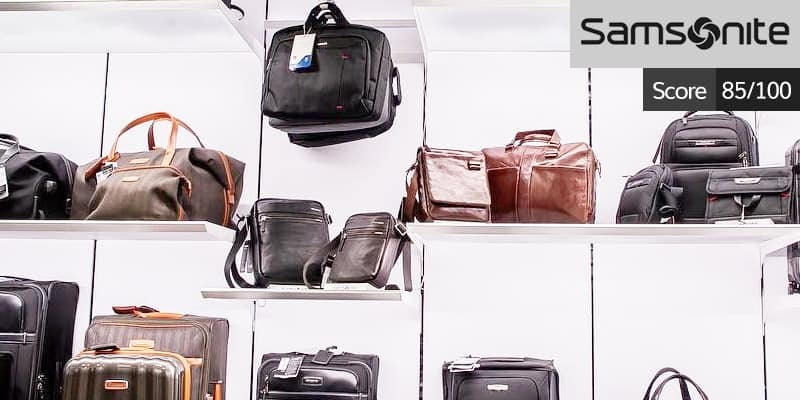 On our rating scale, Samsonite has received 85 out of 100 points. By choosing Samsonite, you’ll get a dependable suitcase that’s valued reasonably affordable, looks good and comes with a warranty you can trust. We’ve also reviewed the most popular models down below and given each one a separate rating. Between testing several Samsonite’s suitcases, the Winfield 2 hardcase got us the most excited. Particularly, by the overall looks and durability. The Winfield 2 is their most popular hardside suitcase available in 20, 24 and 28 inches. First of all, we like how this suitcase looks. Out of all Samsonite’s hardsides, this one is the sleekest and most modern one. The outer shell is made out of polycarbonate, which is more durable than ABS, often used in cheaper suitcases. When compared to other hard shells, this one felt much more flexible. It’s finished with a brushed anti-scratch pattern which takes care of hiding most of the scratches that result from natural wear. From outside, it’s fitted with four spinner wheels. These felt like nothing too advanced when compared to the Spherical wheels on the Samsonite Silhouette Xv fabric carry-on. We wish that they would have used those instead. Aside from the spinner wheels, you also get a TSA compliant combination lock, top and side handles, and a retractable top handle. From the interior, you don’t get too much smart packing options, at least not as much as the Silhouette Xv spinner. The main compartment is split into two equal parts divided by an unzippable fabric sheet. Inside you’ll also find a smaller pocket for your smaller items and two compression straps for keeping your belongings in place. Whenever you run low on space, unzip the expandable zipper, and you’ll get an additional 1.5 inches in width. When compared to the hardside Winfield 2, the softside Silhouette Xv 21-inch is much more advanced in packing features and some other areas. The outer frame is made from rigged tri-core nylon that’s coated with water-resistant SamGuard protection. We’re glad they’ve used nylon over polyester, as it’s more durable and puncture-resistant. Generally, the bag should withstand light rain without your contents getting wet. Overall, the bag feels solid and well-made. The Spherical spinner wheels roll smooth and in a straight line. Due to its dimensions, the bag fits almost all overhead compartments. Although with the wheels, the sizes are slightly too large for the most common 22 x 14 x 9 inches restriction, people report that they’ve easily fitted the bag in the airline measuring basket without any problems. Outside, you’ll find handles on top, sides and the bottom, as well as a retractable handle on top. What’s right about the retractable aluminum handle is that it has eight fixed positions (Usually, you get three or four), so it’s more comfortable to pull. The main compartment is secured with a TSA-approved lock which isn’t too common for fabric suitcases. Inside the main compartment, you’ll find several pockets for smaller items, compression straps, A TSA-compliant toiletry pouch, and a hanger for shirts and other things that shouldn’t get wrinkled. Overall, a nice packing setup for a carry-on of this price. Between all fabric suitcases that Samsonite offers, we believe that this one is the best. Mainly because it’s so affordable, yet offers so many features. Although the Omni PC 3-piece is close behind, we think that the Winfield 2 3-piece luggage set is the best one that Samsonite has to offer. The set is available in 20, 24, and 28 inches. It’s nice to see that all three pieces nicely fit inside each other, so they don’t take too much space when not used. The brushed finish is available in several different colors, like charcoal, deep blue, brushed anthracite, orange, and purple. All three pieces are made from polycarbonate, which is more durable than ABS. The two largest pieces are fitted with expandable zippers, which allows the cases to expand by an additional 1.5 inches in width. Other than that, all three pieces are fitted with TSA-approved combination locks and four spinner wheels. All three pieces feel pretty flexible because the outer shell is made this way. When you compare them to the Omni PC 3-piece set, they’re not as rigid. However, other customers haven’t noticed any issues with cracks or broken inside items, which leads us to believe that flexibility isn’t necessarily a bad thing. From inside, they’re not too advanced. You get two separate compartments in each bag, both divided by an unzippable sheet. Additionally, there’s a large zippered pocket for your smaller items and x shaped compression straps to keep your contents in place. To sum up, we like how affordable, durable, and good-looking the Winfield 2 luggage set is, and that it’s backed by a 10-year Samsonite warranty. It’s very Similar to the Omni PC, but we like the Winfield 2 better because of the good looks. Aside from the looks, the Omni PC luggage set isn’t that much different than the Winfield 2, even though it’s marketed as more durable and made for the rough travelers. The key difference that sets both luggage sets apart is the frame and the overall looks. Although both are made from polycarbonate, the Omni PC seems to be less flexible and more rigid. When comparing the weight, the Omni PC is slightly lighter than the Winfield 2, but only by a small margin. Instead of the brushed Winfield finish, it’s made in a textured diamond finish, which is slightly better at hiding scratches. It’s available in black, bronze, burnt orange, carribean blue, Navy (Our favorite), radiant pink, silver, and teal. In features, both sets are pretty similar. Both have TSA-approved locks, expandable width, and similar spinner wheels. One difference that we noticed is that on the Winfield 2, only both largest bags come with expandable width. In the Omni PC, all three pieces are expandable, which is nice. Inside, you get a pretty similar setup to Winfield. Both parts of the main compartment are split into two equal parts, divided by an unzippable fabric sheet. You also get one large zippered pocket and an x-shaped compression strap. Now when it comes to choosing between the Omni PC set and the Winfield 2, it’s a matter of preference. Both are similarly priced and come with a 10-year warranty. The Omni PC is only slightly better in features, but the Winfield looks better. If you’re looking for something small to keep you organized on your business flights, the Samsonite Business Women’s Mobile Office could do the trick. It’s spacious, organized, and fits under the front seat, which is great for keeping your items at hands reach. The Mobile Office isn’t meant to carry any clothes. It has the room to fit all of your business items, like a laptop, tablet, files, folders, small office supplies, e.t.c. Although you could fit a spare jacket in the main compartment, it’s built for stacking folders and files. It could hold several thick files or up to two half-inch binders. In the second top compartment, there’s a padded laptop sleeve and an elastic pouch for your chargers, a power bank, and other smaller items. In the front compartment, you get several smaller pockets for storage of all of your smaller items: Pens, keys, a passport, e.t.c. The bag comes with four spinner wheels, which are pretty massive. Overall, they feel very well made and roll smoothly. Now when you have to carry the bag, you have several choices. You can carry it by the top handle, use the retractable handle for rolling or secure it on top of a larger carry-on, by wrapping the rear strap around the bigger carry-ons handle. Although a shoulder strap would have been nice, the spinner wheels and the retractable handle make up for it. To top it all off, it’s priced pretty reasonably, and backed by a three-year Samsonite warranty. Overall, a cute bag for your business trips, and to be used regularly for people who need to carry a lot of files and folders. We’re not sure why it’s marketed only for women though, as the bag is professional and doesn’t look like something made specifically for women. If you need something durable, consider investing in the Omni PC suitcase. Out of this list, it’s marketed as the strongest and most durable. However, we’ve noticed, that it’s just as durable as the Winfield 2 and overall, really similar as well. It’s available in 20, 24, and 28 inches, and is priced moderately, very similar to the Winfield 2. It’s made from polycarbonate (Which is more durable than ABS), and the frame feels rigid. Much stiffer than the Winfield 2. The Omni PC is finished in a textured diamond finish, which is pretty good at hiding scratches and is available in black, bronze, carribean blue, navy, radiant pink and teal. For a hardside suitcase, it’s pretty lightweight as well. From outside, the Omni PC is fitted with top and side handles, a retractable handle and four spinner wheels. The wheels felt solid and glided smoothly. The main compartment is secured with a TSA-approved combination lock, which is nice for a suitcase of this price. Inside, the main compartment is split into two parts, separated by an unzippable fabric panel. Also, you’ll find a larger zippered mesh pocket and x-shaped compression straps for keeping your belongings tight. You really don’t get much smart packing options, but the bag is pretty spacious. Although this carry-on has expandable width, by utilizing it your bag will become oversized and will need to be checked in. Overall, we really like the Omni PC and think that it’s one of the best choices for hardside suitcases in this price range (Not only between Samsonite but all brands). We think that the Samsonite Freeform 21-inch hardside is one of the best-looking suitcases that Samsonite has to offer, especially in the white color. Also, it’s one of the cheapest options included in this review. The outer shell is made from polycarbonate (which is stronger than ABS) and feels sturdy. When compared to the Winfield 2 or Omni PC, the Freeform is also more lightweight. Although this case doesn’t have a patterned finish for hiding the scratches, their customers say that it doesn’t show that many scratches, including the one that comes in white. It’s available in black, navy, sage green, tangerine, and white. From outside, the Freeform is fitted with double spinner wheels for smooth moveability, top and side handles, and a retractable handle on top. Although you don’t get any exterior pockets, the main compartment is locked with a TSA-approved combination lock. Although the carry-on is slightly oversized for the most common 22 x 14 x 9 size limit, most of their customers have successfully fitted the bag inside the airlines measuring boxes (A tight fit). Overall, this bag comes with many features that you wouldn’t expect on a suitcase of this price. But the main reason why we’re so hyped about this case is its looks, especially in the white finish. If you prefer somewhat of a more rugged finish, the Samsonite Centric 28-inch might be a solid option for your checked bag. The shell is made out of polycarbonate, which is good because it’s more durable than ABS. Because of the dented construction, the shell isn’t too flexible and feels solid. The Centric is finished with a scratch-resistant patterned twill finish, that hides small scratches. It’s available in black, blue slate, bronze, burnt orange, carribean blue, purple, silver, and teal. From the exterior, the bag is fitted with four spinner wheels, top and side handles, and a retractable handle on top. Another neat feature is that the main compartment can be locked with a TSA-approved lock. Although you don’t get many smart packing features inside, the main compartment is roomy, and the hard shell will keep your items protected. The main compartment is made in a split-book style and contains compression straps and a few pockets for your smaller items. Also, it’s expandable by additional 1.5 inches if you ever run low on space. We’ve given the Centric a lower rating because we’ve seen some quality issues with this case. Especially, with the handles and zippers. The top retractable handle can also feel wobbly when the suitcase is packed full. Not to worry though, because the case is backed by a 10-year Samsonite warranty. The Samsonite Aspire Xlite is a solid and affordable option for a medium-sized checked fabric suitcase. Although it’s not as durable and advanced as the Silhouette Xv, it’s a good option nevertheless. The key difference of why this bag is cheaper than the Silhouette is that it’s made from polyester, instead of nylon. Nylon is more expensive to produce, but it’s more durable as well. The frame is made out of wire, and the corners are padded with plastic layers, so you get a pretty flexible, yet durable suitcase. From outside, the bag is fitted with four spinner wheels, bottom, top, and side handles, and a retractable handle on top. The front part is fitted with two smaller pockets for storing of your smaller items and documents. Most hardside cases don’t offer exterior pockets, which is a plus for purchasing fabric ones instead. Unfortunately, there are no TSA locks, like you would get with the more expensive Silhouette. The interior is really spacious, which is good for a checked case where you don’t have to worry about the weight that much. In it, you’ll find two pockets. One zippered pocket for your smaller items, and a second one that’s waterproof. You can store wet swimsuits and towels in the wet-pocket without having to worry about your other items getting wet. Just note, that wet swimmers aren’t TSA-compliant, because you have to store all liquids in 3.4oz bottles. Overall, this is a nice checked fabric suitcase that would easily last a decade for people who travel several times per year. Not as durable as the Silhouette, but well-made anyway. The Samsonite Andante is rolling duffel is cheap but doesn’t offer such durability as other products by Samsonite. It’s not made for frequent air travel, but it’s perfect for occasional air travel or road trips. If the Andante is on a sale, you can get it for less than 50$, which is uncommon for Samsonite. They’ve managed to score a price so low by using cheaper materials. They’ve used polyester instead of Nylon, and overall the bag lacks additional protecting elements to make it worthwhile for frequent travelers. For instance, the bottom part tends to get scratches and ripped fabric after a while, because the material is too thin. Also, note that the bag is slightly too large to be used as a carry-on. On some airlines, you might slip by, but on most, you will be asked to check the bag in. Overall, the bag lacks durability but is easily compensated by the insanely low price. If you’re looking for something short term, or plan on using it rarely, this rolling duffel is a solid choice.